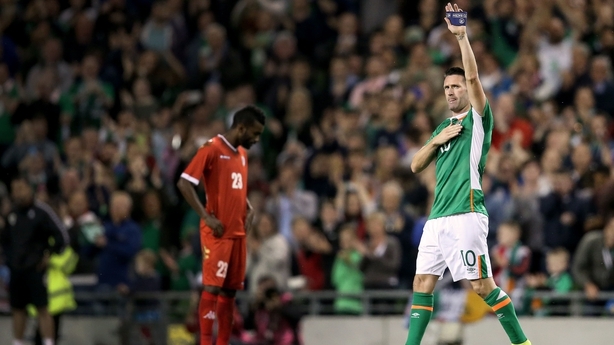 Robbie Keane entertained Irish football fans for the best part of two decades, and the country’s record goalscorer would not disappoint on his final appearance in the green jersey as he smashed home Ireland’s second goal in their rout of Oman. There was a real testimonial feel to the occasion as the Ireland captain entered the arena to a standing ovation, and while the home side were perhaps a little distracted at the start, the visitors were keen to make an immediate impact against their esteemed opponents. Little over a minute was on the clock when Abdulaziz Al Muqbali raced clear down the left flank and won a free-kick as he was chopped down by Harry Arter’s scything challenge. The free led to a corner and the aforementioned Al Muqbali drifted off at the back post, unchallenged, and his downward header had keeper Keiren Westwood scrambling across his goal to punch clearly. But then Ireland woke up and the one-way traffic soon commenced, leading to three-first half goals, and another hatful of chances that emphasised the one-sided nature of this friendly international. All eyes were on Keane, but in the eighth minute, Robbie Brady was first to score, with a pin-point free-kick, whipped into the top corner with that wand-like left foot. The Ireland players were by now attempting to set-up the captain for a departing goal, but Keane has made his career living off scraps in the penalty box and sure enough, the skipper would make his own goal in the 30th minute as he lifted the ball over the bewildered Oman defender. The swivel and shot were textbook Keane as he rattled the net with a perfectly executed volley, which immediately warmed the cool August evening air down Lansdowne Road way. 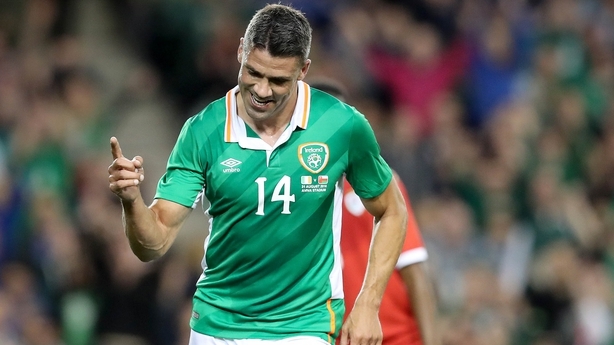 And that would be the last time that Keane would crash the ball home for the Ireland cause, as he was substituted early in the second half, not before Jonathan Walters made it three with an arrowing, downward header in the 34th minute. The bench was emptied in the second half as a host of Ireland regulars enjoyed a run out ahead of Monday’s World Cup qualifier against Serbia in Belgrade, but remarkably only one more goal was to follow, as Walters ran on to a wonderful Harry Arter pass to round the keeper and slide the ball home in the 63rd minute. But the match’s most memorable moment arrived in the 57th minute as the board was hoisted and number 10 was called home for the final time. It is fair to say that this particular curtain has been gradually coming down over the past 12 months, but there was a real feeling of finality in the 57th minute tonight as Robbie Keane ambled slowly off the pitch for the final time. 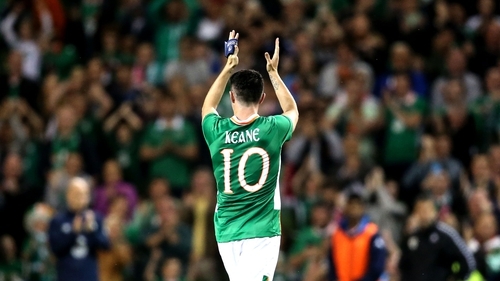 The captain’s dedication has never been in doubt, serving with distinction for 18 years, and Keane’s enthusiasm was again evident as he raced about like that carefree teenager of yesteryear in search of one final goal to complete the epic journey in the green. Oman in opposition certainly helped matters and Ireland raced forward with every opportunity, as Keane got closer and closer to grabbing that farewell goal. But charitable donations were not appreciated as Jonathan Walters was rightly scolded by the captain for not grabbing a goal early on, as he generously afforded Keane a chance when it would have been easier for Walters to shoot. The gesture was served with the best intentions, but with 67 international goals under his belt, the captain would have been fully confident of grabbing a goal worthy of the occasion. And sure enough, that memorable moment arrived with 30 minutes on the clock as the skipper hooked the ball delicately over the defender’s head before falling to his left to connect with perfection and precision to chalk up that 68th goal in the green of Ireland. And while that was a moment for Keane to savour, that perfect passage of play absolutely emphasised the giant-sized hole that the captain’s departure will leave in Martin O’Neill’s Ireland squad. While Robiie Keane was, without doubt, the main feature on tonight’s bill, the undercard offered a lot of interesting aspects, as every other member of the squad, as well as the manager, would have been looking ahead to Serbia on Monday. The second string, so to speak, got a chance to stake their claim to starting jerseys in Belgrade, and while the level of opposition must be taken into consideration, there were a lot of positives to be taken from this 4-0 victory. All eyes were on Harry Arter in the middle of the park after the Bournemouth midfielder missed out on Euro 2016 through injury. And it was not the start that Arter would have wanted as he recklessly went through the Oman number nine with less than a minute on the clock in what is quickly becoming his trademark challenge. But from then on, the midfielder looked a natural fit for that three-man midfield, going about his business with the minimum of fuss, while showing the quality in his ball-retention and range of passing. Arter’s run and sublime, slide-rule pass for Ireland’s fourth goal showed the manager another dimension to his game and it could not have been more timely ahead of the opening World Cup qualifier on Monday. Marc Wilson’s return to the heart of the defence was another welcome option for the manager as the former Stoke City man added a real calming influence in defence, while also proved capable of dropping the ball in behind for willing runners on the flank. Cyrus Christie may not have been tested defensively but yet again, the forward-thinking defender burst up the right wing at every opportunity and has established himself as a reliable replacement to the oft-injured Seamus Coleman. Callum O’Dowda was the last of the six substitutes to stake a claim for Monday and again, the now Bristol City midfielder looked absolutely at ease in these international surroundings. Perhaps a similar role will follow in Belgrade to hand the former Oxford United man his first competitive international cap. The most surprising factor of tonight's game was that sentimentality was put to one side with Robbie Keane not afforded one final reward as he sails off into the California sunset. That accolade was rightly bestowed on Jonathan Walters, who grabbed two more goals in the green of Ireland, displaying the power and passion that comes with every appearance. While Robbie Keane's international tally is unlikely to be surpassed, his campaign goals can certainly be covered by the heart-on-his-sleeve Stoke City man, as Ireland look to qualify for the Russian World Cup in two years' time. And that giant hole left by Keane in the Ireland set-up is gradually being filled by the many now-established names that will bring real quality and experience to the World Cup campaign. Robbie Brady’s set-piece skills were showcased once again, while Shane Long looked lively as ever running the channels, happy to leave the spotlight for Keane all night. Hoolahan, Hendrick, Coleman and McCarthy. Big names aplenty in this Ireland squad and the immediate challenge on Monday will determine if the Euro 2016 experience can be capitalised on in this next exciting chapter in Irish football. Ireland: Westwood (Randolph); Christie, Clark, Wilson, Brady (Ward HT); Quinn (O’Dowda 67), Arter, Whelan (Hendrick HT), Walters; Long (McClean HT), Keane (Hoolahan 57). Oman: Al Rushaidi; Al Mushaifri (Al Mukhain HT), Almukhani, Mabrook, Raboh Bait (Al Busaidi); Al Malki (Al Shuabi 75), Al Shyadi, Al Saadi, Saleh; Al Khaldi (Al Farsi), Al Muqbali (Aal Sbdulsalam 87).